Wash, chop and lightly steam the kale (about 5 minutes). Add to a large mixing bowl. 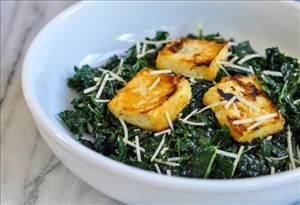 Mix the rest of the ingredients (except the sesame seeds and parmesan) in a small bowl then add to the kale and mix well. Sprinkle with the sesame seeds and grated parmesan. Goes well with miso roasted tofu. 9 members have added this recipe to their cookbook. Gluten free and guilt free healthy sweet slice. Fresh and tasty way to serve broccoli. There are 192 calories in 1 serving of Miso Kale Salad. Calorie Breakdown: 75% fat, 17% carbs, 8% prot.